Facial disfigurement from injury can occur in a fraction of a second and cause life-long emotional, as well as physical, scarring. While early cleansing and meticulous closure in the emergency room is important, permanent scarring may be unsightly and cause distortion of facial features. At the time of your initial consultation, an assessment is made of the thickness, texture and color of the deforming scars and the best option for scar removal. A computerized facial analysis detects distortions of facial features. 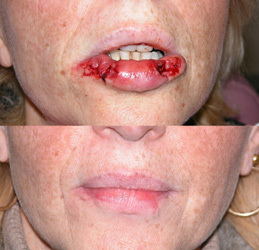 Trauma Patient: Lower Lip Reconstruction After Dog-Bite. 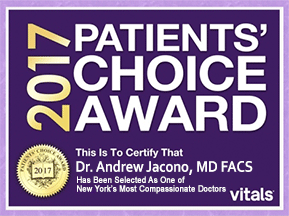 A complete examination by Dr. Jacono focuses on functional abnormalities (e.g., facial weakness, disfunction of chewing or smiling, corneal exposure, etc.). Aesthetic facial restoration entails removal of unsightly contracting scars and rebalancing of facial features by innovative methods of tissue re-arrangement. If bony architecture of the face has been destroyed, a three-dimensional computer imaging of the defect is created. 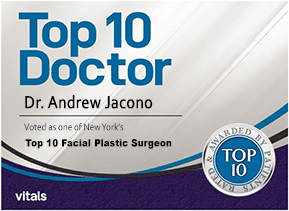 Using this image, Doctor Jacono utilizes the patient’s own body tissues (bone, cartilage and skin) to recreate facial shape and symmetry. After surgery, you will be taught camouflage techniques by a skilled make-up artist to hide incisional sites and blend in blemishes. A custom blended foundation is formulated by our aesthetician to match your skin tone and further hide residual scarring. 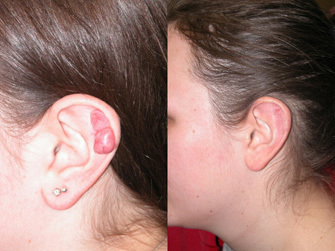 Keloid Patient: This patient has a keloid of the ear from prior ear piercings through the ear cartilage. Correction required removal of the keloid with skin grafting. 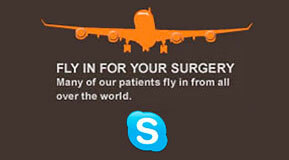 Secondary restorative surgery as well as scar removal and revision is initiated several weeks to months after injury. Facial distortions are evaluated by video computer imaging at the initial consultation, and a surgical protocol is outlined to restore delicate facial balance and symmetry. Sophisticated techniques of meticulous tissue re-arrangement, scar revision and skin grafting are utilized to restore facial features to a more anatomical appearance. While persistent scars cannot be avoided, sophisticated laser technology can flatten and camouflage their unsightly appearance. In extreme cases, where trauma has penetrated the facial muscles or severed the facial nerve, microsurgical techniques of nerve or muscle grafting can lead to restored facial expression. Dog bites account for 800,000 emergency room visits per year.Dog bites are different from other lacerations in that the incidence of infection is 15 times greater than that of routine lacerations because the organisms are more virulent and contain a mixed comtamination of bacteria. Penetrating injuries by the dog’s teeth can inject the deeper tissue and lead to late infection, presenting as redness, fever, and swelling. Anyone with a dog bite more than a scratch should seek medical treatment immediately, especially if the health status of the dog is unknown. Initial treatment should include thorough cleansing, antibiotics, tetanus prophylaxis, and reporting the dog bite to the Health Department to ascertain whether the dog is up to date on rabies and other vaccinations. Deep penetrating injuries and tearing lacerations of the face, lips of ears should be treated by a facial plastic surgeon. Repair of the dog bite requires surgically cutting away the contaminated tissue and thorough irrigation with saline or antibiotic solution. The freshened skin edges are meticulously closed under magnification. Forty percent of all dog bites include tearing away of flesh, which, for the plastic surgeon, entails, not only making the scar less conspicuous, but also replacing lost tissue.